Dun&Bradstreet is the global leader on the market of business information on legal entities. A record in D&B database and digital “Confidence Badge” guarantee trust of business partners all over the world and efficient collaboration with them. “Interfax – Dun&Bradstreet” is the licensed exclusive supplier of Dun&Bradstreet products and services in the Russian Federation, Armenia, Azerbaijan, Belarus, Georgia, Kazakhstan, Kirghizia, Moldova, Tajikistan, Turkmenistan, Uzbekistan и Ukraine. 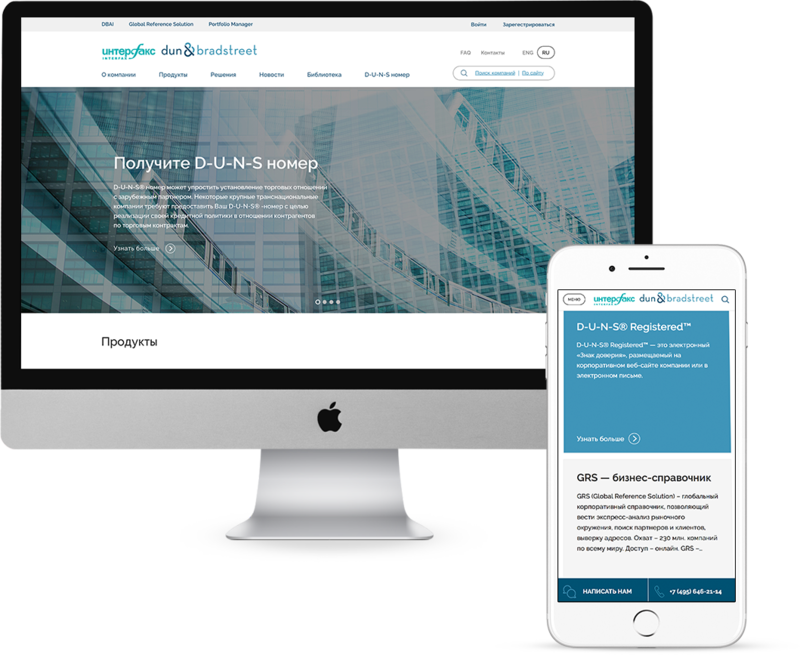 Our job was to rebuild the site for the joint project of “Interfax” and D&B in accordance with complicated corporative standards and to create an online service with the most up-to-date technologies and interfaces. 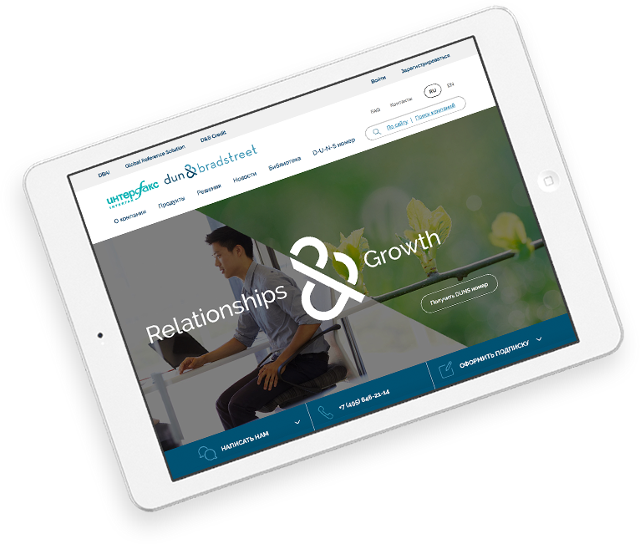 Firstly we redesigned all the site interfaces in accordance with the new corporative style of Dun&Bradstreet. 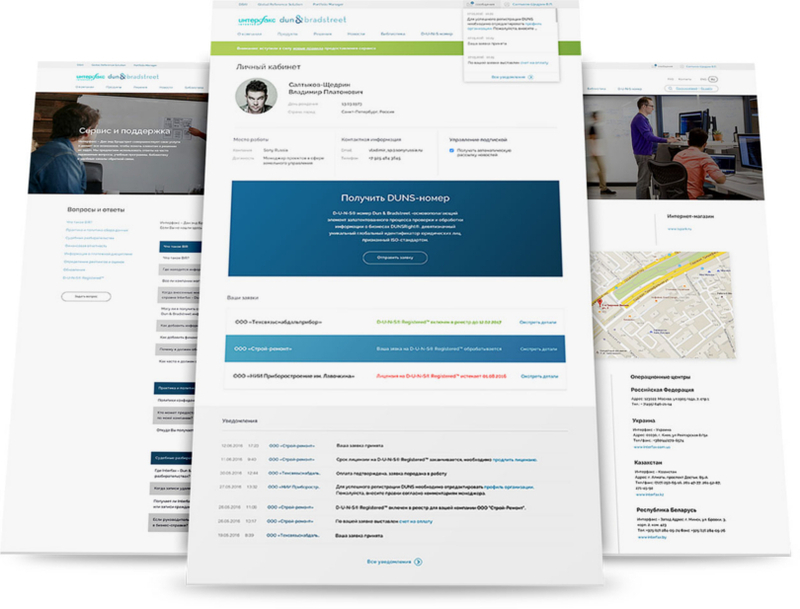 We built an adaptive site that looks perfect on any type of device (desktops, smartphones, tablets). D&B issues and assigns to legal entities unique business identifiers (aka DUNS-numbers) – that is the base of all business processes of D&B. Our aim was to facilitate the work of D&B specialists over requests for DUNS-numbers. So we created a convenient system of request acceptance and registration of new DUNS-numbers in a data-base. The clients’ communication with the site also became easier and more convenient. Now there’s an optimised application form and a handy personal cabinet, where a client can edit his corporative profile, check status of his request for DUNS-number and digital “Confidence badge” and communicate with D&B workers on all the issues.